A valuable collection of medieval and later records document the history of the Duchy of Lancaster. The Duchy archives include records of the Chancellor and Council of the Duchy of Lancaster relating to the administration of the Duchy estate throughout England and Wales and the safeguarding of Duchy privileges and rights. There are also records of the Court of Duchy Chamber consisting mainly of equity proceedings. 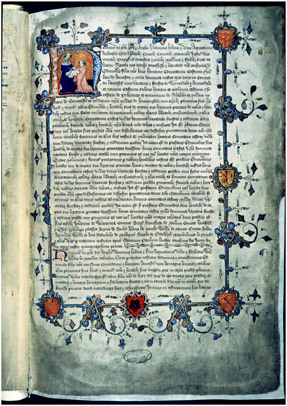 The earliest surviving document dates back to the eleventh century. Of particular historical interest are the great charters which set out the Duchy’s rights, privileges, ownership and status. These take the form of beautifully illustrated manuscripts. Other highlights are contemporary copies of Magna Carta, ancient inventories of holdings and rent rolls, and a fourteenth century account of a tour of inspection of Duchy property by its officers. The documents are of practical as well as historic importance. Verification of some detailed points in current Duchy affairs may still entail reference to ancient documents. Today, most of the great collection is housed in The National Archives at Kew near London. Working records are retained in the Duchy office in central London. Transfers of additional items to Kew are made periodically. Other records relating to local estates are held in county archives. Lancashire County Archives in Preston are a particularly useful source of records relating to the County Palatine. Artefacts from quarries can be found in the Museum of Wales and the Etruria estate papers, Stoke-on-Trent. Academics, family historians and other researchers seeking access to material should begin their search in The National Archives. The list of records held at Kew can be obtained by searching The National Archives online catalogue. A number of historical works may assist with research. Work on the Duchy of Lancaster has been dominated by Robert Somerville, a former Clerk of the Council and Keeper of the Records of the Duchy. The following books and articles by Somerville are useful sources of information. The Duchy of Lancaster (London, 1946). ‘Duchy of Lancaster records’, Transactions of the Royal Historical Society, 4th series, xxix (1947), pp 1-17. ‘Duchy and County Palatine of Lancaster’, Transactions of the Historic Society of Lancashire and Cheshire, ciii (1951), pp 59-67. History of the Duchy of Lancaster (2 vols, London, 1953 and 1970) is available for purchase from the Duchy of Lancaster office in central London. Office-Holders in the Duchy and County Palatine of Lancaster from 1603 (Chichester, 1972). ‘Ordinances for the Duchy of Lancaster’, Camden Miscellany vol xxvi, Camden 4th series, xiv (1975), pp 1-29. Duchy of Lancaster booklet 1999 (available from the Duchy office).